In 1937, Margaret Bourke-White composed an incredible portrait of American life in a photograph entitled “At the Time of the Louisville Flood.” The photograph depicts 16 African-Americans standing in a line, carrying various containers as if they were collecting items to take with them. All of these individuals standing in line wearing nice cold weather attire with looks of indifference. A striking feature of this photo is that they are standing in front of a billboard that depicts a traditional Caucasian family riding through the countryside with a look of great joy. The family even has a dog with his head hanging out the side of the window as if he is having the time of his life, followed by two daughters with one gazing at her mother in complete assurance that they are having a good time. Above the family, the billboard title proudly reads “World’s Highest Standard of Living” and to really drive the point home the text beside the car with the smiling husband reads “There’s no way like the American Way.” This photograph was taken during the 1937 Louisville floods that displaced hundreds of thousands from their homes, much in same manner as the victims of our modern day Hurricane Katrina. 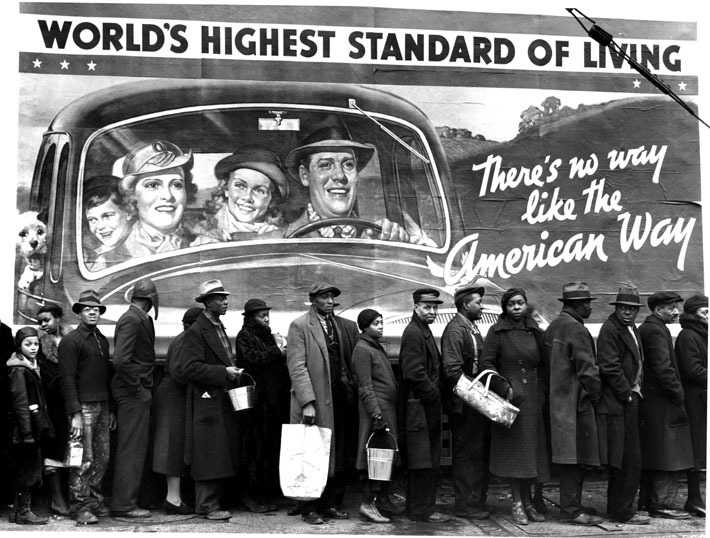 The photograph “At the Time of the Louisville Flood” by Margaret Bourke-White employs social realism to underscore the racial inequalities or class division of America in 1937 by revealing the struggles of African-Americans, promotion of consumerism, which fuels the ignorance of African-American struggles by Caucasians. An important artistic movement during the 1930s, Social Realism became prevalent during the Great Depression, depicting racial injustice, which was epitomized in Bourke-White’s powerful photograph. America was going through a tough time this decade as government’s resources were running thin after managing a depression and the Dust Bowl crisis a few years prior. The depression or more commonly known as the Great Depression was a result of the United States economy being tied to the rest of the world’s economy, along with the stock market crash of 1929, which led to a growing paralysis that swept the nation until 1940. 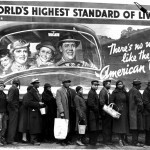 The Great Depression inspired many art works depicting the economic oppression and misery, including photography. Margaret Bourke-White at the time was a photojournalist for the newly created Life magazine who photographed draught victims of the Dust Bowl and then subsequently was sent to Louisville for the Ohio River floods. In 1937, the famous Louisville flood picture was published in Life magazine and went on to continue to publish many photographs that documented the life struggles of ordinary citizens. During this time, the civil rights movement had not even occurred yet and African-Americans were still defining themselves during the emerging age of Jazz and the popular Harlem Renaissance. While suffering through injustice, they were moving towards equality and defining themselves. The set back of the Ohio River Flood set them back as nearly 70% of Louisville citizens were uprooted from the homes that were lifted off foundations or became uninhabitable. This is strikingly familiar with the more recent Hurricane Katrina event, where the distress of African-Americans have been etched into the minds of the American audience who witnessed the tragedy through similar photographs that were published in magazines and news websites. As with Katrina, the Louisville citizens turned to the government for shelter and sustenance as the individuals are pictured in Bourke-White’s Louisville flood photograph. Taking a closer, in depth look at the Louisville flood photograph, it reveals some interesting details in the line of African-Americans, which requires a more critical eye. The most obvious feature of the picture is simply a line of African-Americans waiting for a hand out of some sort; one we can only imagine is a line for food or perhaps toiletries. The United States government sponsored a program to document a record of these types of conditions; this came to be known as documentary photography. Although, the country is dealing with a depression and local lives are even further complicated by being displaced from their homes, the individuals photographed are dressed pretty well. Women have beautiful long pea coats, clean hats; heels and two women are even shown wearing hosiery in great condition. The men are depicted wearing nice long coats, non-wrinkled pants and all of which are wearing hats. One item to note is that the shoes being worn by the men are quite dirty, which could indicate that these men are either working or performing an awful lot of walking. There is also a single child in line wearing a nice leather jacket, ear-flapped hat and a nice set of high laced up boots. Imagine this picture without the billboard behind it, or without any sense of when it was taken, these people could just be the middle class standing in line one morning waiting for the grocery store to open up. For all we know, perhaps this is what it truly is, but due to the location and time this picture was taken, we are lead to believe that there are places in America that are struggling while being taunted by a billboard they are standing in front of which makes for an incredible message. The billboard is an archetype of Americana that carries some notable social and political implications. At a first glance, we see a carefree family driving a brand new car through the countryside. Everyone in the picture has a big smile, including the dog looks ecstatic during the ride. The billboard boasts with pride selling the American dream to everyone and promoting the idea of completing the traditional family with a vehicle, nice clothes and consuming gas to keep spirits high. Some may say that the billboard was created and posted before the depression ended; however, it is more likely that it is propaganda art in of itself used to raise consumer confidence and to promote consumerism in order to set the economy wheels in motion. As depicted in the billboard, if the children see that mom and dad are happy, and then they will be indoctrinated into thinking that if they are a successful consumer that they will be happy as well. We can even see that painfully today as people drive themselves deep into debt amassing more material possessions as they have been sold the dream by their parents that the path to happiness is conspicuous consumption. Not all Americans are quite sold on this dream, as the African-American population continues to struggle through hard times that the couple pictured on the billboard most likely cannot even fathom. Set apart, both the elements of the line of African-Americans and the billboard itself tell their own story, however combined these elements set out to evoke a quite different, political response. This picture as it was originally photographed through the eye of Bourke-White and subsequently published in Life magazine was intended to underscore a perceived inequality of Caucasians versus the African-American population. It is almost that white people are so ignorant of the black’s struggles they could just run right over them. The sheer irony of the words boldly printed above them stating that just by being in America they are granted the highest standard of living like everyone else should be enjoying is a lie. This shows that not everyone in America is living on easy street or carelessly driving through the countryside. It sends the message that the white population in this country has a better standard of living; they also could not care what kind of struggles the black populations are going through. In light of recent events, we can even see this today with the Treyvon Martin case where the New Black Panthers sent a strong message out to the black community stating that blacks are still continually held back by the “blond hair, blue eyed” man. They stated that capitalism empowers the whites and holds back the blacks. This photograph taken 75 years ago serves as a banner to the struggle that the African-American movement still feels today and how they want whites to wake up and understand what they are going through. The Louisville flood photograph is an amazing photograph that combines propaganda art and the struggles of African-Americans into a series of stories for all Americans. 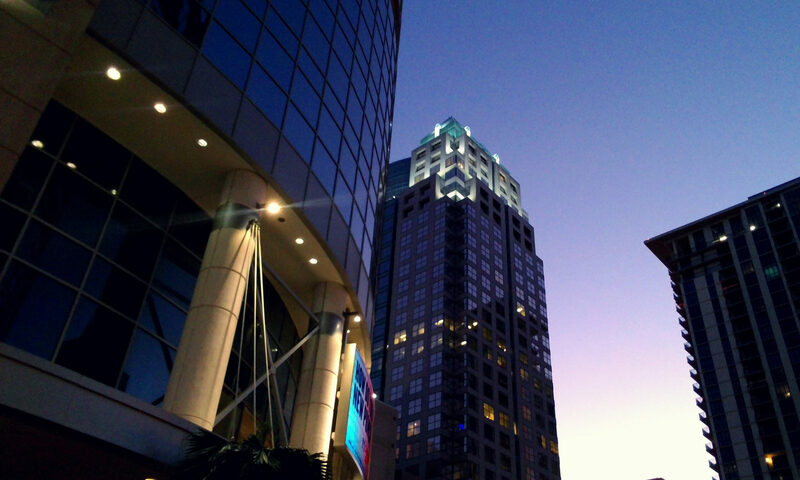 At a glance, it tells a story of the perseverance of the American spirit throughout history. It chronicles the tragedy of civil rights, segregation and inequality retrospectively and even is still an effective reminder for today. It paints the epic tale of how even though African-Americans can struggle, they do not let them keep them down, they keep pushing through. It tells a story of how those who have everything are blissfully unaware of those that live on the verge of poverty as the gap in that divides class should really appreciate what they have because it too can be taken from them as well. It recites the reminder that no one is immune to the destructive force of Mother Nature and the more material possessions that you collect the more vulnerable you become. There is beauty in hardship and artistic photographers like Margaret Bourke-White will be watching us from the sidelines. They will continue authoring these portraits of our trials and tribulations so that we can continue to reevaluate ourselves, to keep looking back, and learn from making the same mistakes. This realism captured is a product of the lives we have lived, it is quintessential to view this amalgam of sorrows and learn from the wisdom they give.